One of the provisions offered by the new Service was free eye examinations and spectacles for children and adults. For many families at this time, spectacles would have been considered a big expense and only affordable through schemes like National Health Insurance. The public demand went way beyond the government’s initial expectations, costing in the first year alone almost five times more than predicted. This figure did not decline the next year, instead it nearly doubled, with patients waiting up to 18-months before they would receive their spectacles. 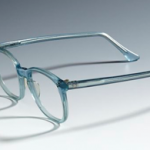 For children the options were almost as limited, but from the 1970s they had the choice of coloured acetate frames in the following hues: ice blue, crystal, flesh, light brown mottle, dark brown mottle and black. One point of difference in the design of the children’s spectacles was that the arms curved inwards and the feet were made to circle around the child’s ears, in a bid to keep the spectacles from sliding off during play. These design features may have prevented the glasses from falling off, but could also make them pinch painfully.